The final disbursement for 2014 was released by the Georgia Department of Revenue at the first of this month, but it was for November. Collections are delayed by a month, and December holiday collections will be released the first of February. Athens-Clarke County collected $5.7 million in revenue from its SPLOST in the final quarter of 2014, up 5.1 percent from the previous quarter, or an increase of 1.2 percentage points more than that of Oconee County. Barrow County collected $2.3 million, virtually unchanged from the third quarter of 2014. Revenues from the 1 percent sales tax have not increased consistently quarter-to-quarter across time in any of the three counties. Monthly figures are even more volatile, making quarterly comparisons more informative. Oconee County saw growth of 10.1 percent from the third quarter of 2013 to the fourth quarter of 2013, compared with the 3.9 percent growth from the third quarter of 2014 to the fourth quarter in 2014. Same quarter comparisons show that the fourth quarter revenue in Oconee County was 8.3 percent greater than the revenue collected in the fourth quarter of 2013, while third quarter revenue in 2014 was 14.8 percent higher the revenue for the third quarter of 2013. The second quarter of 2014 produced revenue that was 12.5 percent higher than in that same quarter in 2013, and the first quarter of 2014 was 6.7 percent greater than the revenue for the first quarter of 2013. 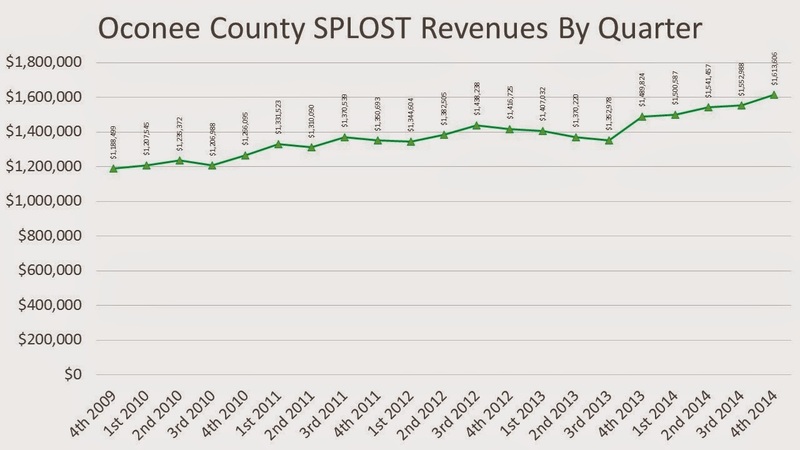 The current Oconee County SPLOST began in the fourth quarter of 2009 and will run only for three more quarters, that is, through the end of September of this year. I created the tables for all three counties based on the calendar for SPLOST 2009 in Oconee County. Barrow and Clarke counties also have a 1 percent tax, but they are on a different schedule. Barrow County’s current SPLOST began in 2011 and will run for six years. The Athens-Clarke County SPLOST began in 2010 and will run for nine years. Oconee county officials have budgeted for the 2009 SPLOST at 80 percent of the $40.4 million originally projected for the tax, but they also used an estimate of $35 million (87.5 percent) in the run up to the 2015 SPLOST. Voters approved that tax last November. If the county collects the same amounts in the remaining three quarters of the 2009 SPLOST as it collected in the last three quarters, the tax would have generated a little less than $33.6 million, or 83.1 percent of the original projection. If the county has the same rate of growth in the remaining three quarters against those same quarters a year ago, the tax would generate a little less than $34 million, or 84.1 percent of projection. Board of Commissioners Chairman Melvin Davis, in comments before the county’s Industrial Development Authority this afternoon, expressed optimism about future growth in SPLOST revenue, given the continued commercial development in the county. Clarke County, as the chart above indicates, also is on line to show strong growth, even though it has not had the same visible level of commercial development as has Oconee County. Oconee County has projected revenue from the 2015 SPLOST at $55.6 million. A high projection has two advantages. County officials were able to increase the list of projects presented to voters for funding in SPLOST 2015 over SPLOST 2009 because of the larger amount projected. 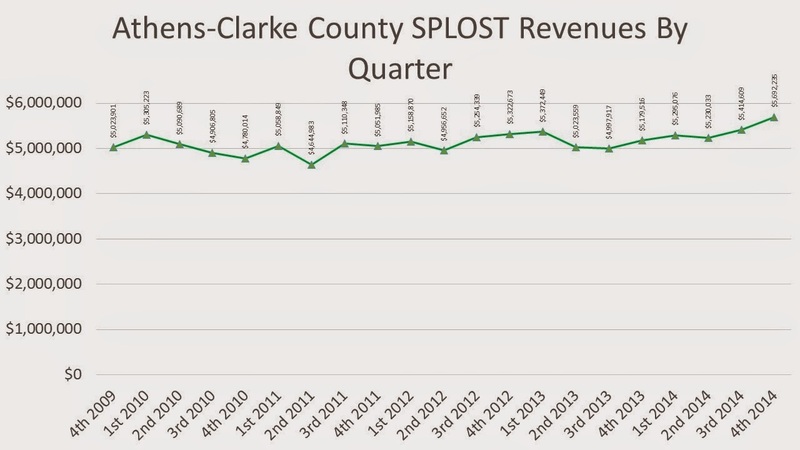 The county also used the expected shortfall in 2009 SPLOST revenues as a rationale for reallocating monies disproportionately among the SPLOST projects. The commissioners did just that last May, when they shifted funding from water and sewer projects to pay off the debt for the jail. If the county doesn’t reach the projected $55.6 million for SPLOST 2015, the BOC will once again be able to shift money around among the listed projects presented to voters last November. Oconee County's SPLOST 2004 was projected to bring in $25 million, and collections exceeded that amount. 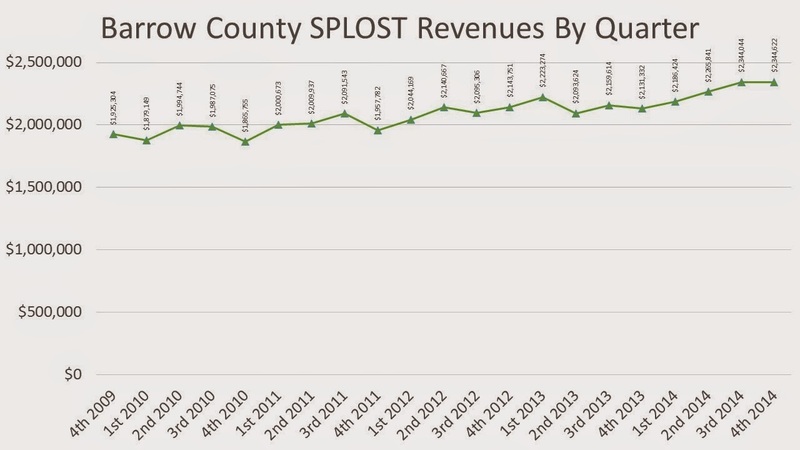 The county has not yet spent all of the revenue from SPLOST 2004. Let's see....What can we spend it for? Softball fields need sprucing up.